High-end adjuster screw generally applies to 127-254 TPI (Thread Per Inch) matched ultra-fine thread screw and nut/bushing integration that is used to provide extremely precise axial linear positioning as a result of turning the screw a specified number of degrees. High-end adjuster screws are described by the screw diameter size designation as well as the exact linear displacement per single revolution of the set. Such High-end adjuster screws sets are used in a wide variety of precision instrumentation, fine mechanism adjustments and metering devices. 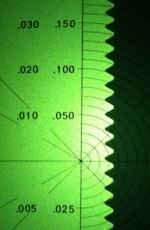 The High-end adjuster screw pitch#, thread class#, and thread quality determines the resolution of the integration. Typical High-end adjuster screw pitch specifications are ranging 0.1mm to 0.2 mm per revolution, or 127 to 254 TPI. Fine adjuster screws generally apply to 40-100 TPI screws and nut/bushings where interchangeability# and cost of the assembly are key parameters. The thread class for these fine adjuster screws are typical 3A/3B the tightest thread class. Note that Base Lab Tools offer adjusters that are better than class 3A/3B that will have better performance and reduce the need for “sticky” grease to accommodate for the loose tolerance. These devices will have less backlash and longer life expectancy than standard 3A/3B adjusters. The adjuster screws that Base Lab Tools is offering are designed for performance and cost. That means that all aspects of the design have been reviewed to ensure that performance is never compromised. An example of this effort is a true epoxy free design to get the very best centration of the ball tip. Also, by removing the need for epoxy the operating temperature range for the adjuster was increased as well as the long term stability of the product. It should be noted that some competitors are offering different epoxies in the adjusters to enable it to work in different applications e.g. vacuum or high temperature. The nut/bushing is of great importance for the performance of the High-end adjuster screws not only the length and class of the nut/busing is of importance but also the material itself. In low cost adjusters where grease can be used and wear and load is small brass is typically the most economical material to use. In High-end adjusters where tight tolerances are required as well as the capability to withstand wear and higher load phosphor bronze is the preferred material. Phosphor bronze is considered a self-lubricating material that makes it ideal for grease free applications e.g. vacuum. Still, the use of grease will extend the lifetime of the nut/bushing and is recommended unless a grease free version is required. In general terms a longer nut/bushing will have better performance than a shorter nut/bushing if Pitch and Yaw of the adjuster screw is of importance. In the High-end adjuster screws Base Lab Tools is using phosphor bronze nut/bushings to allow for high loads and grease free configurations upon request. Adjustments of the adjustment screw are typically made using a thumb screw or and Allen key. It should be noted that the adjustment interface can be made compatible with fully utomated solutions e.g. gear boxes, capstan drive etc. Adjuster screws are available in single- and dual-contact. Single-contact screws have a looser fit between the screw and nut components so that only one side of each course of threads on the screw contacts only one side of the corresponding thread of the nut/bushing. When the engagement is rotated in the opposite direction, the other side of the respective thread is in contact. These are meant to turn quite easily with minimum turning torque. The dual-contact type applies contact to both sides of each thread, to the point where there is zero axial lash or linear motion possible with mere axial tugging. The only axial motion possible is by rotating the screw engagement. The assembly process begins by producing the appropriate sized mating hole for the threaded nut/bushing. We recommend the use of a reamer to achieve a circular hole with the proper diameter. Given the close fit between the threaded nut/bushing and the mating adjuster screw, we cannot stress enough the importance of making a circular hole with the proper hole diameter. 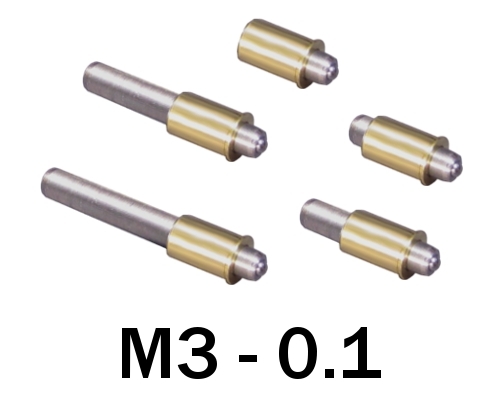 The hole should be 0 to 0.0003”smaller than the nut/bushing. For our own production needs, we use we combine the press fit with a permanent anaerobic adhesive e.g. Loctite 603, 609 or equivalent that provides excellent long-term performance. It is essential that both surfaces be completely free of grease for proper curing of the adhesive. The nut/bushing should be put in place using a press tool or similar to ensure that thenut/bushing is put in straight into the hole. If the nut/bushing is deformed the adjuster screw might get stuck in the nut/bushing. As shown in Figure 1, it is important to mount the nut/bushing such that any axial force is taken up by the mounting ﬂange. Axial force should not be carried by the adhesive since creep may occur. The benefit of the press fit over a loose fit is the unbeaten performance of the nut/bushing mounting surface joint. The assembly process begins by producing the appropriate sized mating hole for the threaded nut/bushing. For our own production needs, we use a permanent anaerobic retainer that provides excellent long-term performance. We recommend using Loctite Anaerobic Retainer product numbers 609, 648, 680 or equivalent. In order to ensure maximum strength between the bonded parts, we strongly urge the user to follow carefully the instructions provided by Loctite, which specify the amount of clearance between the threaded nut/bushing and the mounting plate. It is essential that both surfaces be completely free of grease for proper curing of the adhesive. The most common source of failure is not allowing for the proper clearance between the parts being bonded since this clearance provides for the proper volume of adhesive. It is important to mount the nut/bushing such that any axial force is taken up by the mounting ﬂange. Axial force should not be carried by the adhesive. Axial force should not be carried by the adhesive since creep may occur. 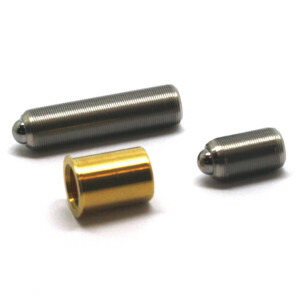 When assembling, apply a small amount of the Loctite adhesive to both threaded nut/bushings and the mounting plate and ensure a uniform distribution of the adhesive around the perimeter of the parts before assembly. After insertion, remove any excess adhesive from around the part.